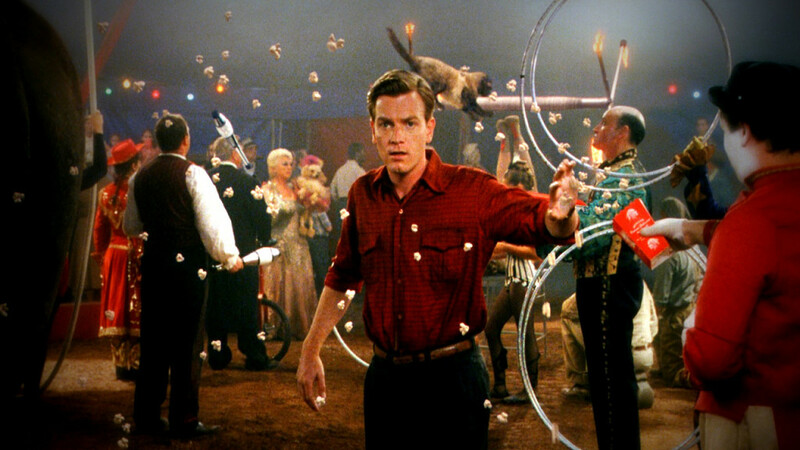 Big Fish Review; Here Fishy, Fishy, Fishy! 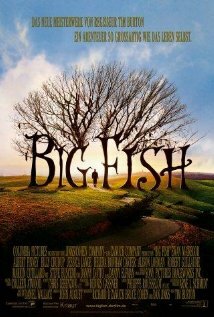 Big Fish is 2003 movie by Tim Burton based on the 1998 novel of the same name by Daniel Wallace. It looks at the father-son relationship as well as storytelling. The fairy tale elements are woven into the story the father tells which creates a nice somewhat fluid narrative though this movie is not without its flaws. This movie presents a very simple story in a very complicated manner. Very simply, it’s about a man who is trying to reconcile his father’s tall tales with his real life. In hearing the stories and seeking them out he learns that there is a half true to them but the impossible and grand stories are better to leave behind as a legacy. Of course the stories feature things like, giants, conjoined twins, werewolves, witches, mermaids and a very creepy yet happy town. 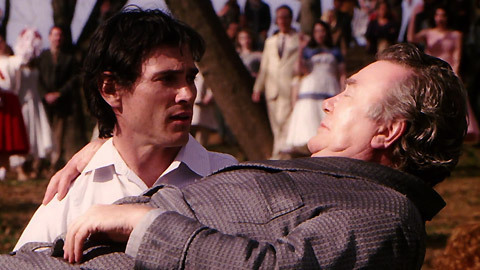 The biggest thing about this movie is that all the stories were true to a far degree just mostly exaggerated to give them more importance and so that the father would in a sense live on through the stories. However this movie despite it grandness in a normal life is predictable and doesn’t offer any surprises. Is that a bad thing? No, but it worth noting and by the film’s own admission it complicates a simple story. In a weird way this movie with its dreamy story vignettes would make you think this story wasn’t about the characters. And while the technicals stand out more than the characters, I would say this should be a character piece at least it’s about the father and son, but no one else really has a personality. In fact the father, Edward Bloom has two personalities. Older Ed seems to only want to tell his stories and talk about himself while the younger version is a people person who wants to help. Both are ambitious and want to be “Big Fish” but I can’t really reconciles my mind around these two facets and I’m left not really liking either of them. The son Will is a complainer. He wants the truth but he can’t handle the truth. Actually the truth is boring. Really he just the foil to his dad and nothing else. Though I did like the touch that he is a reporter, where he has to report the facts as they are. The de-facto star of the movie are the technicals. It is a really lovely and dream-like in the shots and cinematography. The use of colors of bright and cheerful for the stories and darker for hard realities. It’s a great movie to watch. The acting is mostly good but nothing amazing, though listening to Ewan McGregor do a Southern accent made me think of Vivien Leigh, though didn’t he use a Southern accent in Down with Love, which I saw on a plane. Also The Danny Elfman score is very Elfman-eseque which is lovely, fitting to the story and predictable. 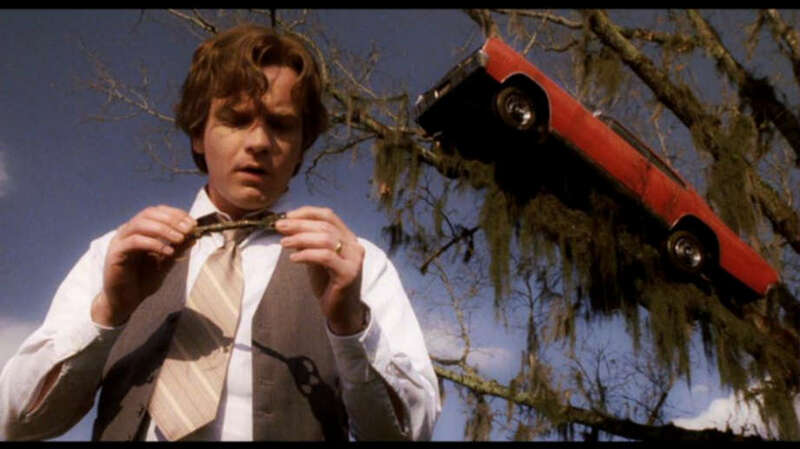 Big Fish is a lovely movie though it has its issues it well paced and is touching.